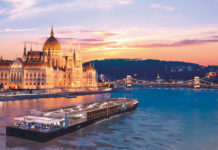 Compagnie du Ponant has launched its summer 2012 cruises brochure featuring more than 80 sailings from 4 – 14 nights, between March and October next year. The 130-page brochure promotes a range of destinations and themed cruises from music and golf to gastronomy, family and soft expedition. Compagnie du Ponant is the only French cruise line and now operates a fleet of five, individual ships of character: Le Ponant (64 passengers), Le Levant (90 passengers), Le Daimant (226 passengers) and Le Boréal and L’Austral (264 passengers), which were launched in 2010 and 2011 respectively. As well as these new cruises, Compagnie du Ponant explores far away destinations and includes expeditions to the North Pole, Baffin Sea, Spitsbergen and Greenland aboard Le Boreal.